Wine Review: 2009 BV Coastal Estates Pinot Noir | Wine Splash! Life is a bowl of cherries and so is this wine! If you enjoy a Pinot Noir with a cherry explosion, you have found your golden calf. We tend to buy wines and keep them for a few months (or longer) until we drink the wines that are currently on our “On Deck” wine rack. When those are depleted, we race into the cellar and choose another 12 wines to go “On Deck”. We didn’t keep this one in the cellar long but felt it should go nicely with tonight’s meal. In our glass, this wine was a bright, ruby color. On the nose was ripe cherry, raspberry, and cinnamon spice. This pinot noir was beckoning to be baked in a Cherry Pie! The mouthfeel was medium body, soft, and silky. Even though this is a dry wine, flavors of sweet ripe cherry burst over my palate! Hints of plum, dried cranberry, and light spices followed into a nice, silky finish. Not a long finish, but left you with the feeling of wanting more! We paired this pinot noir with bbq pork chops with a sweet bbq sauce. It went together perfectly! We feel it would also pair well with any pork dish, medium cheeses, roast turkey, salmon, or a healthy salad. This style wine is the type you could drink everyday. Soft tannins, fruity, and easy to drink. 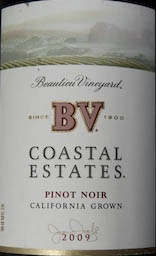 We give the 2009 BV Vineyard Coastal Estates Pinot Noir an 88 point rating! This is one we would pick up again since it was a great value at $11 a bottle. (when we purchased it on sale). If you have a 2009 vintage, we suggest you drink it by 2013 at the latest. WineSplashing! !